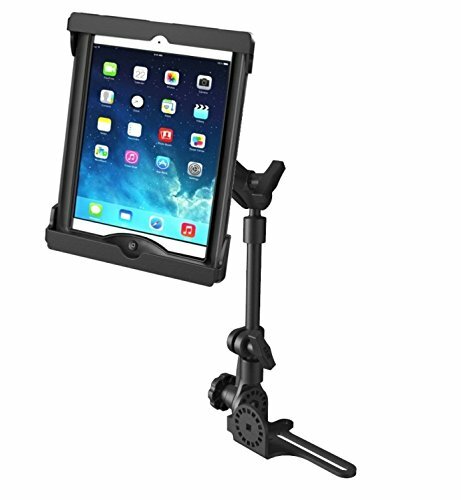 No-Drill RAM POD HD Car Suv Truck Mount Holder Kit fits Apple iPad Air 1 & 2 by RAM at iShare Maps. MPN: RAM-316-HD-238U TAB20U. Hurry! Limited time offer. Offer valid only while supplies last. Blending the best of versatility, strength and installation ease; the RAM ToughPod HD is a workhorse for fleet and serious consumers alike. Blending the best of versatility, strength and installation ease; the RAM ToughPod HD is a workhorse for fleet and serious consumers alike. Compatible with a wide range of vehicles and simple to install, the RAM ToughPod HD is an ideal solution for mounting tablets, small laptops and other similar devices. Requiring minimal space in the vehicle cab, it can be remove quickly without the use of tools. The versatility of the RAM ToughPod HD makes it an ideal solution for mixed vehicle fleets, consumer vehicles of all types and other applications which require a robust mounting platform for your tablet. Low Profile, Low Cost and Extremely Robust: - The minimalist design offers a low profile form factor while offering an extremely robust mounting platform - Ideal mounting solution for fleet and service vehicle fleets with a varying range of vehicles. Stands up to the demands of field applications Highly Versatile: - Angle adjustment feature to compensate for varying floorboard angles - Can be used as a horizontal or vertical flat surface drill-down mount - aluminum post can be cut to size in order to accommodate varying vehicle configurations Easy to Install and Remove: - Works on most vehicles. Fast and simple installation, requires no drilling or modification to your vehicle - Attaches using an existing seat rail bolt or seat track - Remove the upper portion of the mount with the turn of one knob, creating valuable space in the cab when the mount is not in use Pole Length: Minimum: 18.75" Maximum: 25.75" Cradle Dimensions: Height: 9.5" to 12.125" Width: 6.55" to 7.43" Depth: 0.3" to 0.875" *Note: Will fit devices with case, skin or sleeve. View More In Vehicle Mounts. If you have any questions about this product by RAM, contact us by completing and submitting the form below. If you are looking for a specif part number, please include it with your message.